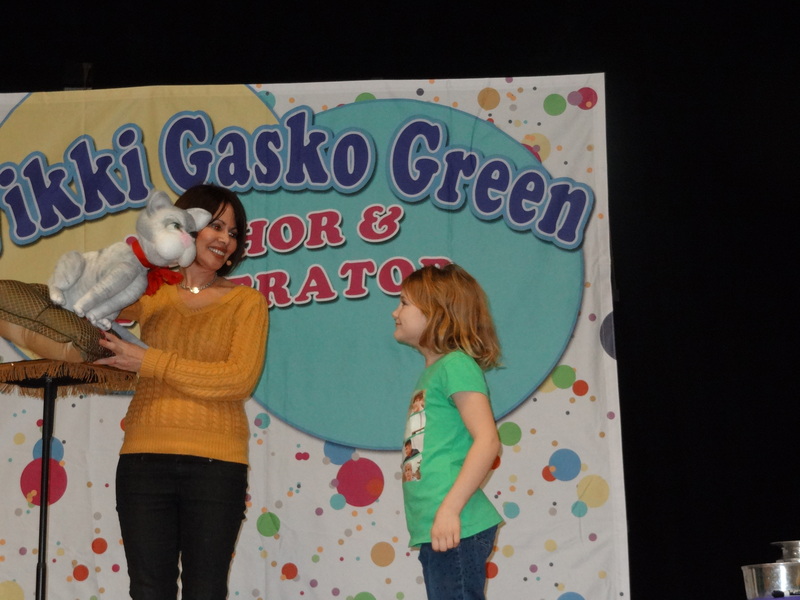 Vikki Gasko Green, award winning ventriloquist out of Michigan brings her AUTHOR SHOW to life with ventriloquism, fun magic, and a huge dose of audience participation. It is such a difficult task with all the distractions kids face today, to get kids to read or write. Reading is an important preface to writing. Reading expands our imagination and increases our knowledge. 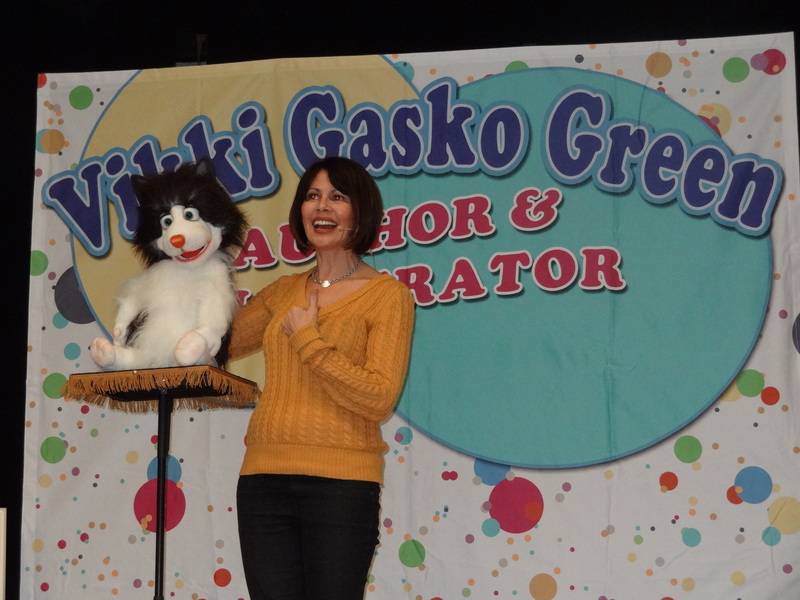 Using her ventriloquism and magic, the Author show brings an excitement to the students of potential of being a great reader and writer. Make a sceduled time each day to read and write. Toby the dog with a volunteer, encourages students to write from what they know and experience. The Kitties in the hat trick jogs the students imagination by creating a small story with a beginning, middle and end reminding students that every story has a conflict and resolution. Rico the Mexican chihuahua, uses magic to go through the process of self publishing. Self publishing means SELF Publishing. There are many villains out there trying to scare people and take their money. NEVER pay money to someone to publish your book. 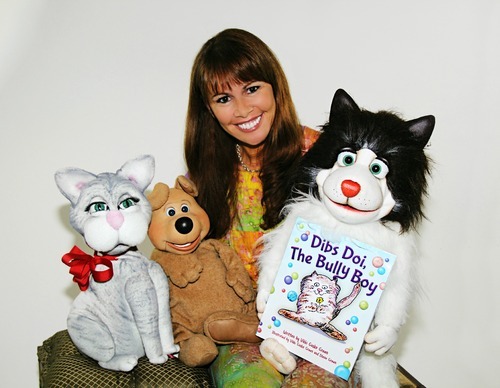 Dibs Doi the cat, introduces the book Dibs Doi, The Bully Boy. A couple examples from the book show Dibs that being a bully is never a good. 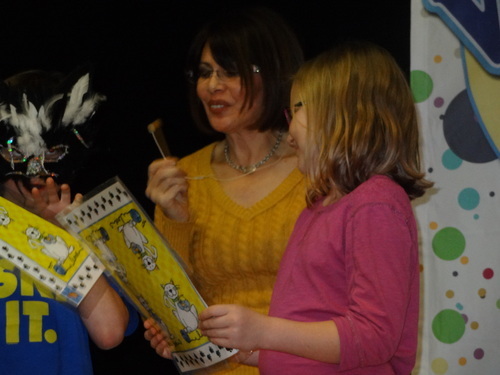 Volunteers come up to perform a play called Kitty Cons. Catty Computer Game, Tabby TV, and Persian Put­It­Off try to distract our hero from writing. Students fill in the blanks of a story allowing them to create the beginning of the story which can sometimes be the hardest thing to do. The audience participates as drawing a character on a board allows them input on how many eyes and noses the character has as well as how big they want the ears. This excercise is a great jump start on imagination and helps students think outside the box. A reminder of what was learned. Will they put time aside each day to read and write. What exercises in writing help them the most? What can each of them do to see if writing is something they would enjoy doing? Use the company BOOKEMON www.bookemon.com to create a book. It costs nothing and is a fun way to see your book published. You can do it individually or as a classroom.